Being an important checkpoint in Raja Ampat Regency, Sorong City becomes more popular among travelers. From there, people can visit numerous islands by speedboat. The city even has a nickname, which is “Kota Minyak” (the City of Oil). Thanks to the presence of NNGPM or Nederlands Nieuw-Guinea Petroleum Maatschappij. The company does oil mining since 1935 and makes the city more famous over time. Today, it gets more visitors every single day. Not to mention there is Sorong Port, on which tourists can rent a speedboat. 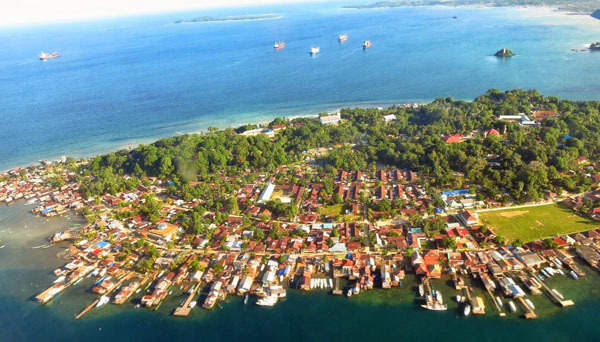 Sorong City is located near to the sea. No wonder, Sorong Port becomes quite crowded over time. The reason is tourists consider the site as a perfect checkpoint to reach nearby islands. Thanks to the speedboat service. The streets in Sorong City are not quite jam-packed, so visitors can explore any parts of the town easily. Many types of facilities and accommodations are also available there. These include hotels, restaurants, and nature attractions. When it comes to transportation, people can take advantage of buses and taxis. In fact, some ojeks are also available! Before getting around Sorong City, it is better to learn a little bit about its history. The name derives from the word “Soren”. The meaning is a wavy and deep sea. This belongs to Biak Numfor Tribe’s language, actually. For tourists, the information is considered important. Even the locals may tell it to any visitors. In accordance to people in Sorong, their city was also visited by many missionaries and merchants. No wonder, it has several types of culture including Europe and Chinese. In terms of tourism, Sorong City is indeed popular. Many types of tourist attractions are available there. For example, there is a famous beach called Tanjung Kasuari. People are impressed by its stunning white sand and superb seascape. That means the beach becomes the most visited tourist spot in Sorong. Apart from it, there are several islands like Doom, Soop, and Raam. All of them are worth a visit, so island hopping is considered a recommended thing to do there. Another popular vacation destination is Dofior Wall that is famous for its sea scenery and sunset. Some tourists come to Sorong City for numerous reasons. Apart from tourism, they are attracted in its industry. The fact is that Sorong has a significant contribution to Raja Ampat’s economy. As mentioned before, the most famous company is NNGPM. It is even famous among travelers, on which people can visit and witness the business activity there. Overall, Sorong City is a worthy vacation, so everyone should visit it. Sorong City is quite accessible. Thanks to the existence of Sorong Port and Domine Eduard Osok Airport. That means tourists have several options to reach the location. For those coming from other provinces, it is better to take an airplane, which is faster and more comfortable. When it comes to local transportation service, Sorong City has both buses and taxis.